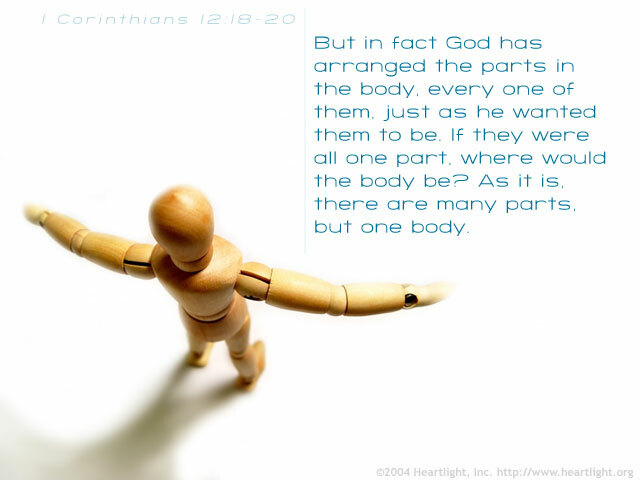 The Apostle Paul reminds us that God assigns our roles in the Body of Christ. Several principles interact with God's choice. First, be faithful in what God has given you to do — until we are faithful in/with little things, he will not entrust us with big ones (Luke 16:10-13). Second, if we don't use what he has given us, it will be taken away (Matt. 25:14-30). Third, we reap what we sow — sinful or irresponsible behavior can create consequences that limit the effectiveness of our service (Gal. 6:7-8). Bottom line — let's be faithful with what God has given us, let's serve him when given new opportunities, and let's honor him with our choices so that Satan cannot use our failure to interfere with our service! Dear Father and LORD of heaven and earth, please help me see my opportunities to serve in your Kingdom. Please grow my effectiveness in your service so that I can bring you glory and be a blessing to the Body of Christ. In Jesus' name. Amen.